With all that's going on in the world today, some people might be thinking that if there is a God, he isn't really paying much attention. Their concerns are realized in TBS' new comedy series Miracle Workers — at least based on the first teaser the network released on Wednesday, which introduces the Creator as very much (maybe too much) a "Laissez-faire" chief executive. The seven-episode limited series, which TBS also announced will premiere February 12, is described as a "heaven-set workplace comedy." It's created by Simon Rich (Man Seeking Woman), based on his book What in God's Name, and boasts Saturday Night Live's Lorne Michaels as an executive producer. Also serving as executive producers of Miracle Workers are the show's stars, Steve Buscemi and Daniel Radcliffe. Former Harry Potter star Radcliffe plays Craig, a low-level angel responsible for handling all of humanity's prayers. Buscemi is Craig's boss, the big man himself — God (Buscemi replaced Owen Wilson in the role late last year). 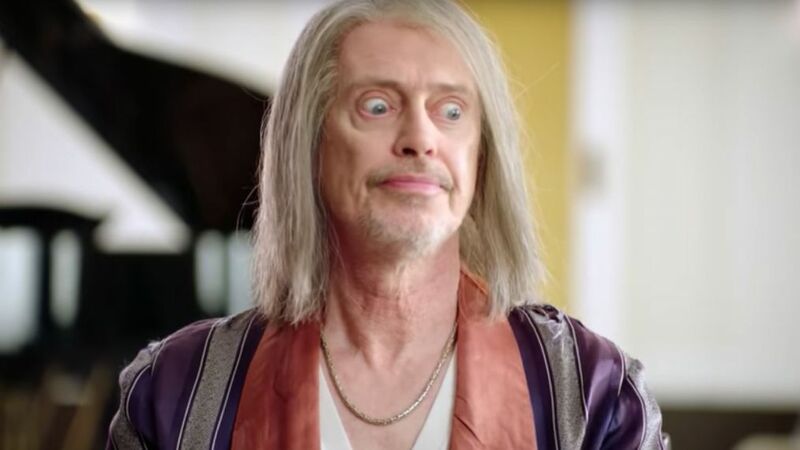 But as you can see in the teaser for the show below, Buscemi's God — looking like some combo of a '60s burnout and Gandalf — has pretty much checked out of humanity and seems like he would rather focus on more petty concerns, like perhaps finding a better form for himself than Steve Buscemi (we kid, Steve, we kid). As Craig bursts into God's office announcing an urgent prayer, the Almighty rolls his eyes at the inconvenience. When the prayer is revealed to be desperately begging God to stop a terrible typhoon, all the Lord can focus on is why "typhoon" isn't called something more obvious, like "wooshy-wooshy." The fact that God seems so bored and disengaged from his creation sounds like it will be a bit of a concern, given that over the course of the series, Craig and fellow angel Eliza (Geraldine Viswanathan) must prevent Earth's destruction by answering a seemingly impossible prayer: help two humans, Laura and Sam (Sasha Compere and Jon Bass), fall in love. Will God end up caring enough about what he spent seven days creating to help out? Miracle Workers will also feature guest stars Tituss Burgess, Margaret Cho, Angela Kinsey, Tim Meadows, John Reynolds, Looly Adefope and Chris Parnell throughout its first season. Plus, the star shares the shows he's binging right now and his plans for directing. When the comedy was first announced a year-and-a-half ago, it was described as an anthology series, but there wasn't an indication in Wednesday's release if that was still the case, or if future seasons would be similarly self-contained "limited series" as these first seven episodes were dubbed.